UKMW prompts correction relating to this question: How many settlements are in the West Bank? Let’s test your knowledge on Israeli settlements. Which of the following represents the total number of settlements, including illegal outposts, in the West Bank? The pace of settlement home construction has actually slowed somewhat since 2009, in comparison to previous years. Israel hasn’t constructed a new settlement in approximately two decades. Though the media often suggests (by the volume and sensational nature of their settlement stories) that new settlements are constructed all the time, what they’re typically alluding to are new homes within existing settlement boundaries. There’s widespread agreement that most major settlement blocs (which represents the overwhelming majority of construction across the green line) will almost certainly remain part of Israel in any future peace deal. The map below represents the peace offer made by Ehud Olmert in 2008, a territorial compromise which by most accounts, is – broadly speaking – similar to the likely outcome of any such final agreement. 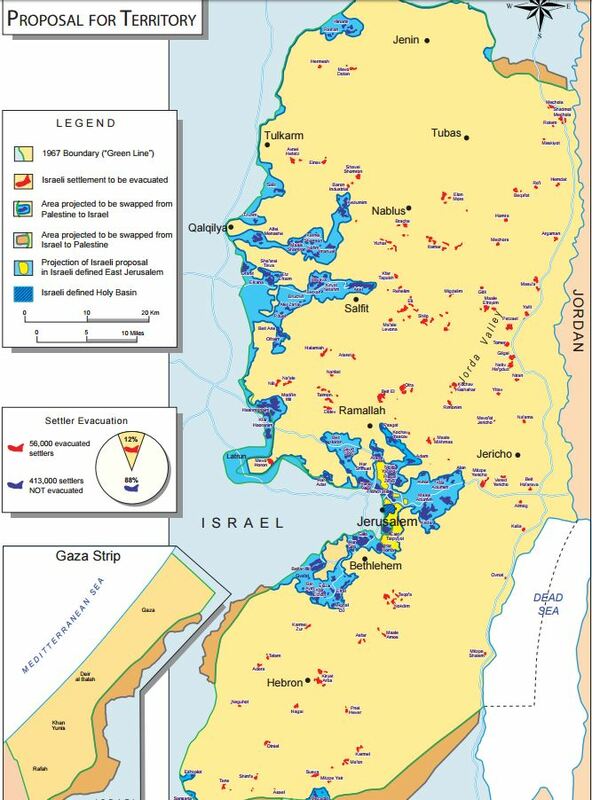 Note that most of the blue area (which Israel would annex) represents major settlement blocs. Map representing Ehud Olmert’s offer to Mahmoud Abbas in 2008. Following our tweet, we emailed Times of London editors, expressing our concerns with the headline, which falsely suggests that Israel was constructing new settlements. They upheld our complaint and amended the headline to note that new “settlement homes” (within existing settlements) were to be constructed, not new settlements. Revised Times of London headline. Whatever one’s views on Israeli construction across the green line, the narrative often advanced in the UK media – of new settlements expanding at ‘a record pace’, eating away at ‘huge swaths’ of Palestinian territory and rendering a future Palestinian state nearly impossible – is, at best, extraordinarily misleading. Unpacking Avi Shlaim’s claim in the Guardian that occupation is “the root of all evil”. All settlements/villages and cities built in Judea, Samaria and around Jerusalem are legal unless they were built on privately owned land. The latter being the case, the outposts should either be dismantled and moved to government lands or alternative land should be offered to the land owners. In any case these illegal settlements should be dismantled. The law is the law and no one is above the law. How can you get so worked up about the wording of settlements vs settlement homes when Israel still has its civilians living all over occupied territory, including in e.g. Shadmot Mehola? It’s no wonder the UN passed that recent resolution. Spare us the faux outrage, please. When Muslims can’t even get along with fellow Muslims, how can any sane person expect Muslims to get along with Jews, Christians, Hindus, Buddhists, Zoroastrians, Atheists…? I believe that Israelis have the right to acquire land in the West Bank and build homes on land they acquire. On the other hand, there is a political reason for Israelis to avoid building homes in the West Bank. They may wake up one day and find that they are living on land that is not part of Israel and that they are governed by Palestinians. I understand that there are arguments that some legal experts make to the effect that Israeli settlements in the West Bank are illegal. But this issue has not been adjudicated in a proper impartial international court of law. The UN is the most absurdly anti Israeli forum in the world and its pronouncements on this issue are without legal value. They are political acts against Israeli with predictable anti Israeli outcomes. I believe that if Jordanians settled in the West Bank between 1948 and 1967, there would be absolute silence about Jordanian settlements in occupied territory. And there was no clamoring by the Palestinians for their Jordanian rulers in those years to stop occupying their land. The Palestinians have telegraphed their real motives. They can’t tolerate the existence of Israel. The Palestinians need to decide if they want to start governing themselves in a state that will live side by side in peace with a Jewish state.